The rate of knee surgery in the United States is virtually out of control. In 2017 over 700,000 total knee replacements were performed. According to the Journal of Bone and Joint Surgery article in 2005, this rate is expected to increase by 3.5 million surgeries per year by 2030. And this is just total knee replacements. Surgeons are performing literally millions of arthroscopies yearly, and America has a rate of arthroscopies 2x higher than England and Ontario, Canada. We are a country almost totally reliant on pain medications and surgery for issues that may not even improve with these treatment methods. Yes, you read that correctly. Knee surgery is not actually an effective treatment for knee pain for most people. But, you say, “my uncle had an arthroscopy and said the pain was gone.” And our question to you is, have you talked to your uncle two years after surgery? In 2016 a British medical journal confirmed the pain relief from arthroscopic knee surgery is “inconsequential,” and the method of pain-relieving medications leading to surgery needs to be evaluated. In the same study, the researchers found the result of exercise was indistinguishable from surgery. This means people had the same amount of relief after two years from exercises specific to knee pain as they did from surgery. The mean age for knee surgery is 45+ years and research even back in 2008 was showing that too many knee replacements and arthroscopies are done compared to the results they get. The complications with knee replacements include risk of blood clot, infection and complications from anesthesia. This is in addition to risks of implant malfunctions and the implant wearing out. You have to consider how long the knee replacement will function so you can’t get a knee replacement too early, which leaves many people chasing pain with medications far too long. We mentioned above that exercise and arthroscopy have similar outcomes, so why not just choose the quicker surgical option since both have similar results? Well, unfortunately, the risk of arthritis significantly increases the risk for arthritis after only 1 year post-scope, even if a further surgery isn’t performed. 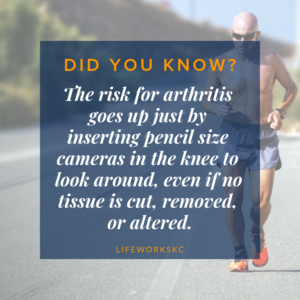 Don’t miss this– the risk for arthritis goes up just by inserting pencil size cameras in the knee to look around, even if no tissue is cut, removed, or altered. This is a big reason to stop and really consider the impact of arthroscopy since arthritis is much easier to prevent than to deal with once it has started. Tylenol, Aleve, and Advil are usually the first step people take towards addressing their knee pain. These anti-inflammatory drugs can seem harmless and inconsequential to your health while providing some ease throughout the day. However, what research and clinical experience is showing is that NSAIDs have long term complications like an increased risk for stomach ulcers, gastric bleeding, stomach pain, nausea, diarrhea, heartburn, and bloating. Too many people shrug those side effects off thinking “that won’t happen to me.” But, then it does and you have a laundry list of health issues to address simply from taking too much Aleve for too many years. When NSAIDs no longer work, people feel forced to “level up” with the type of pain medicine used. Simple conditions such as knee, back, and shoulder pain are a huge part of the opioid crisis happening in America. Research shows there is a 50% chance you will become addicted to opioids and there is no way to determine ahead of time which 50% you will be in. This makes taking opioid pain medications a massive gamble, even for real pain, taken and prescribed appropriately. Next in line for typical treatments is steroid injections. The main issue with these is they are not a solution, but only a short term symptom management tool. Even without severe side effects, only a few injections can be done per year as more can actually cause the cartilage and joint to deteriorate. Other side effects are risks for nerve damage, joint infection, tendon weakening, and thinning of surrounding bone. Knee pain needs treatment that is up to speed with the research. For over a decade research within the specialty of orthopedics, bone, joint, and general pain management has proven that knee surgeries are too frequent and most often do not give the desired results, yet in the mainstream medical community, treatment options remain paralyzed in the progression of NSAIDS, steroid injections, opioids then surgery. There is another way! The combination of the right strengthening exercises and stem cell therapy can be a game changer when it comes to actually solving your knee pain. Rehab exercises that strengthen and stabilize the muscles surrounding the knee are the types of exercise that research has proven to be as effective as surgery. Yet very few people take advantage of this affordable and proven treatment. The Rehab Team at LifeWorks Integrative Health understands knee exercises and how to get your muscles balanced and stabilized to help your pain. Stem cell therapy is the proven safe and effective solution for knee pain that not only may heal the torn tissue, but avoids surgery all together. By injecting mesenchymal stem cells (MSCs) into the damaged tissue, real healing can occur. Stem cells inherently know where to go and what to do to in the body meaning your pain is not covered up, or temporarily lessened. Your pain goes away because the injury heals. By pairing stem cell therapy with rehab therapy, the damaged tissue can repair and any imbalanced movements that either created the injury or developed after the injury can be strengthened. The muscle structures around the knee and through the hips need to function properly in order to prevent compensating movements that create or complicate injuries. Stem cell therapy is the proven non-surgical option for almost every type of knee injury, knee pain, and knee degeneration. Don’t settle for all the trouble that typical knee pain options create, get the real healing you need to get you back to the life you deserve.